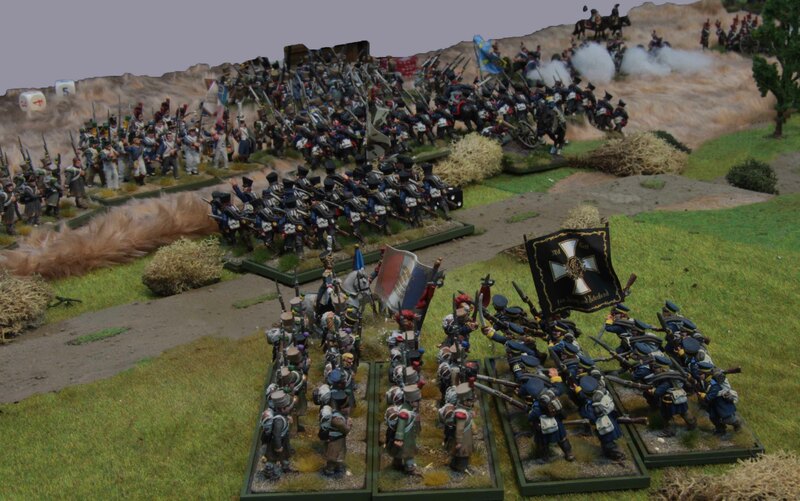 Some of you might remember my review of Offensive Miniatures French Artillery last year. 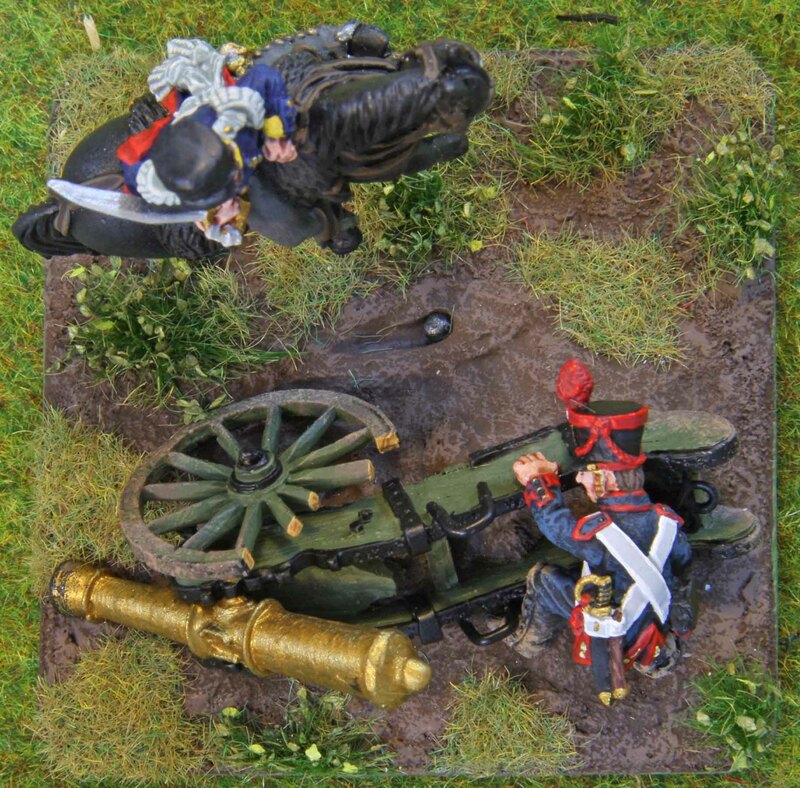 Well a couple of weeks ago Dave from Offensive Miniatures asked me if I would be willing to do a review of their French Napoleonic Artillery Casualties pack (FNFR252). 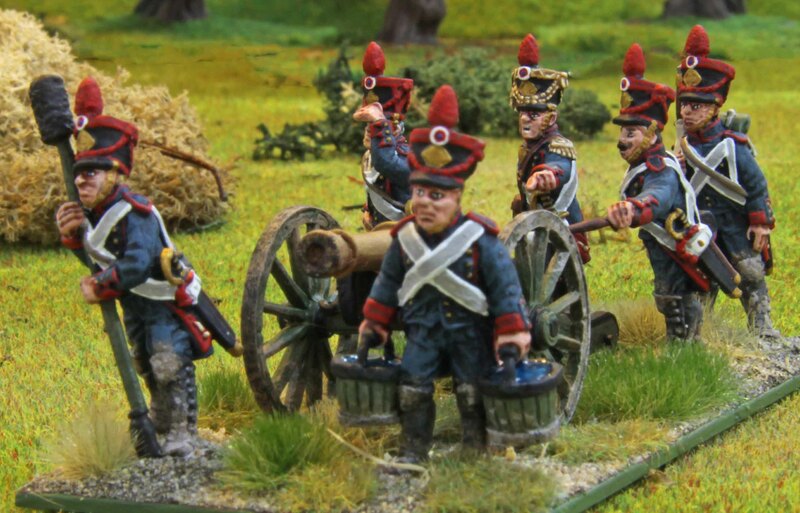 Obviously I was happy to oblige, especially since there is a general lack of artillery casualties on the market and I was keen to lay my hands on them. So what is in the pack. You get two small vignettes. 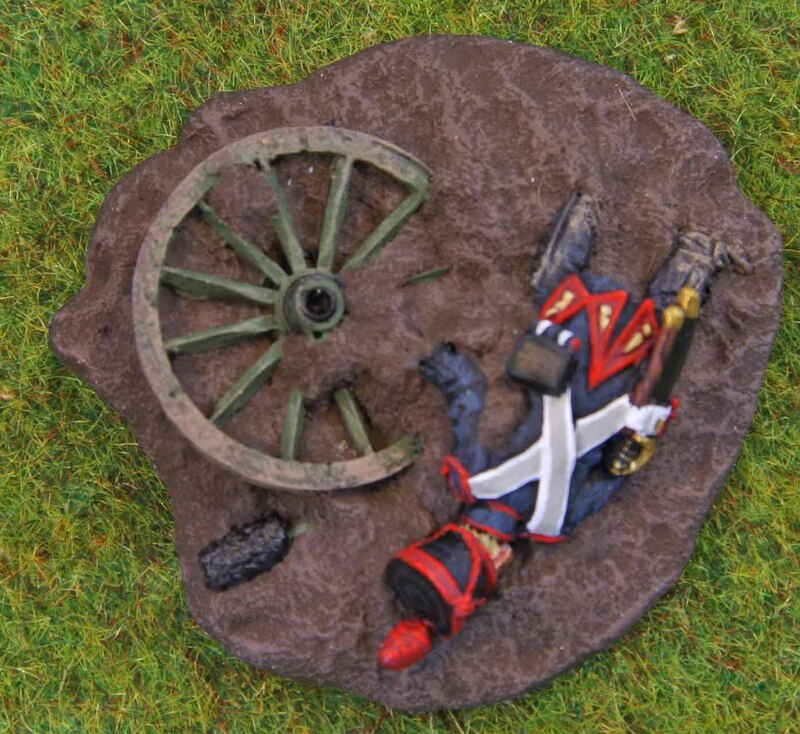 One is a dead artilleryman laying facedown besides a wheel, the other one is a dead artilleryman lying sprawled over the half buried carriage of a 12pdr gun. 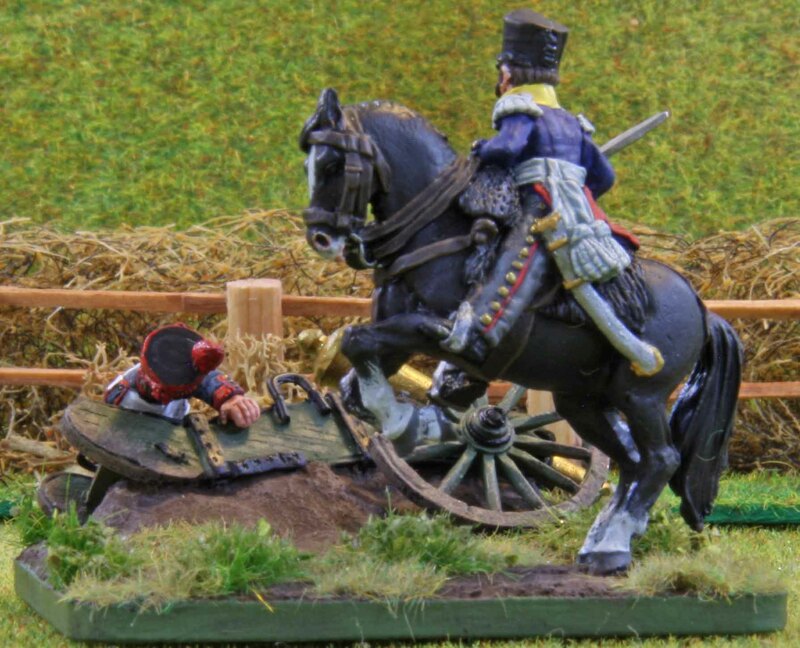 The later features a displaced barrel and a broken wheel on the carriage. Both are cast mainly in resin. Why mainly? 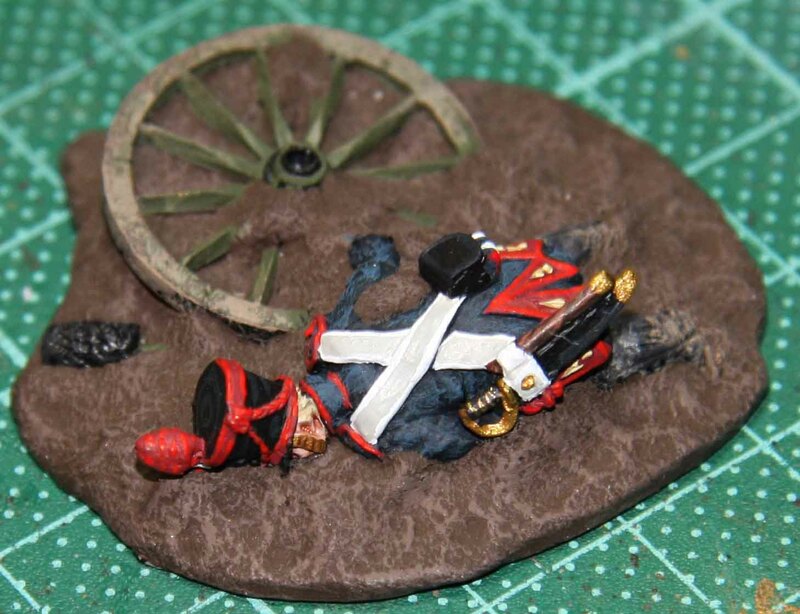 Well the axle on the carriage is definitely a brass rod and while cleaning them up the pieces up, the soldiers became very shiny where I scratched them with the hobby knife, so I suppose those are white metal. The barrel and broken wheel were white metal. Everything was already primed in a mid grey, which is nice, since cleaning up resin can be a pain in the behind at times. The official retail is 10 GB£, which I think is fair for what is essentially two minis, a gun and two diorama bases. So my first impression? Well I was a bit skeptic to be honest. 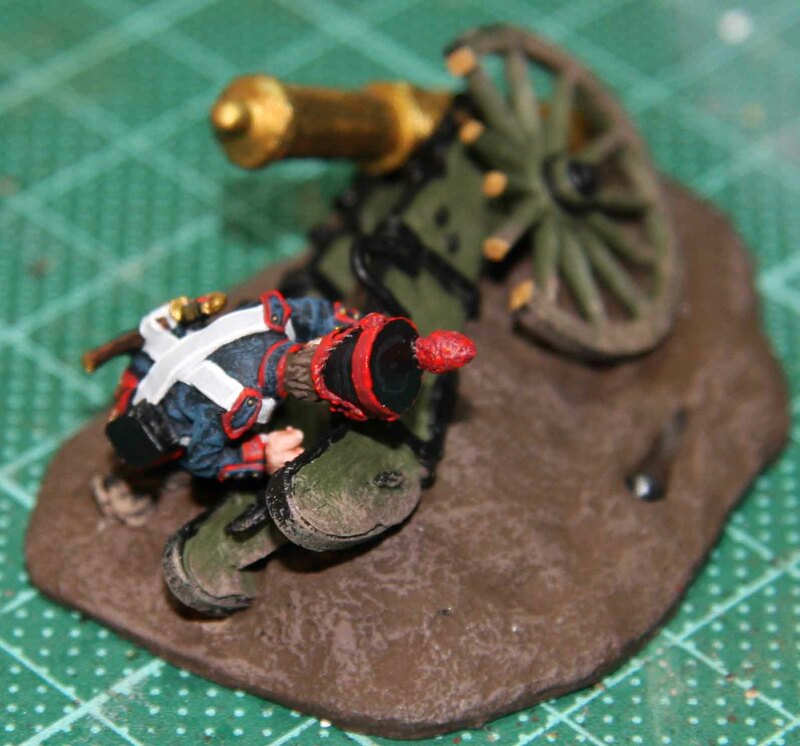 Having painted their original set of artillery last year, I quickly realised that the two dead soldiers were not dedicated new sculpts but slightly rearranged versions of the original artillery crew. With the uniformity of the grey primer, it was hard to tell, if they would look like proper casualties or too animated to be dead (sorry for such a grotesque wording) and I decided to leave my final decision to the moment they were finished. Otherwise I was quiet happy with what I got. The castings were very clean and flesh was minimal. Over all I think I spend less than five minutes cleaning these up and I am pedantic about these things. The nice thing about the carriage piece was that there were impressions on the base. So it was easy to know where the barrel and dead trooper were supposed to fit for the best look. A little word of advise regarding the preparation and painting. The bottom of the pieces is very smooth and if you want to glue them to a base you should definitely roughen them up before you paint them. I found it best to paint the carriage piece un-assembled. 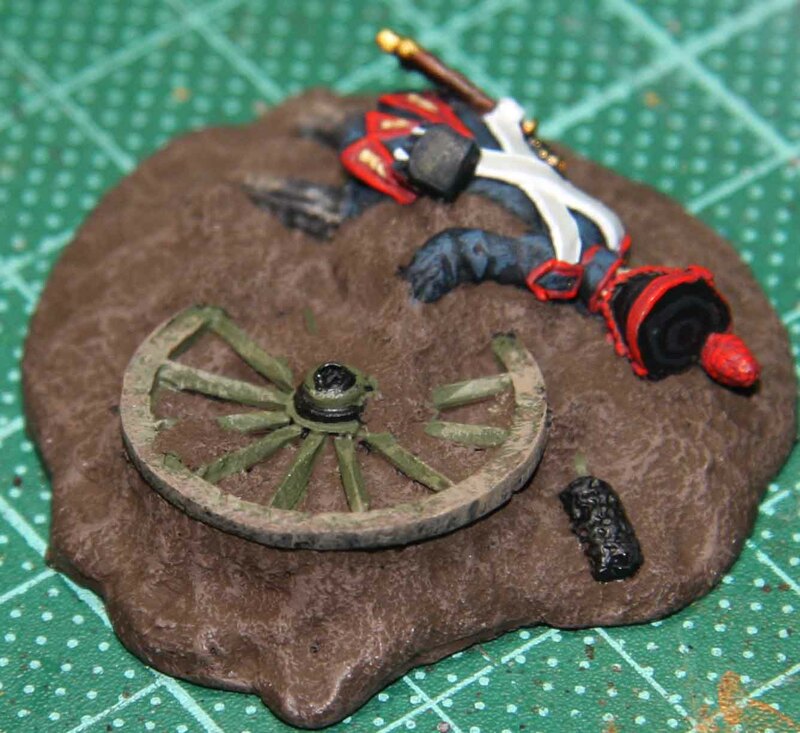 Since the dead soldier, broken wheel and barrel come as separate pieces, there are lots of open spaces between them and the base carriage itself. These would be hard to reach with a brush when already assembled. Also I would advise to paint the soil first followed by the rest. The soil has a nice structure that lends itself to drybrushing and it is easiest to do this first. Talking of structure… The carriage itself has the nice defined structure I have already seen on their artillery set and this worked well for drybrushing as well. So final impressions. Well my first scepticism evaporated when painting and assembling them. Even though the dead crew are “just” variations of the living crew, it does not show. I was very impressed with the soldier hanging over the carriage in this respect. If you place his feet and knee in the locator impressions on the base, he really looks like he was made for this piece. As I said before, the casting quality and detail / structure are superb and made these a joy to paint. Overall I can highly recommend this set. 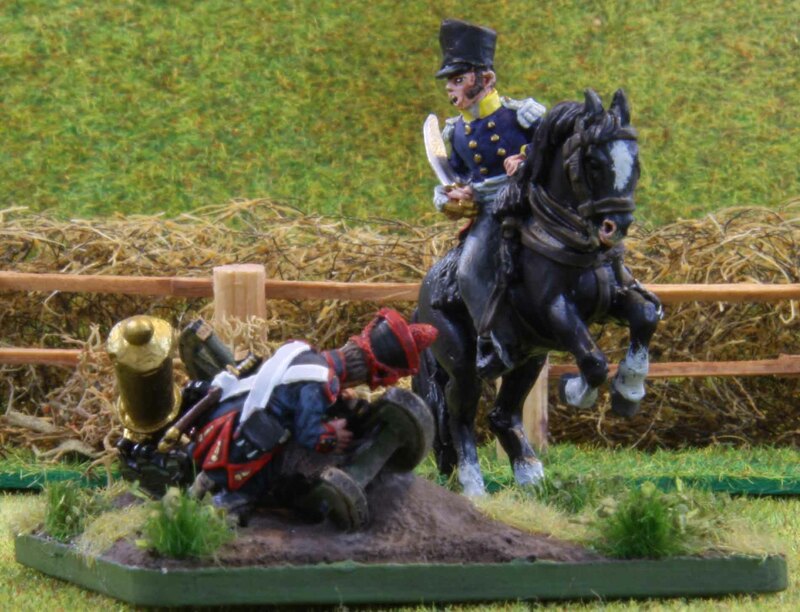 It is unique, since to my knowledge this is the only set with artillery casualties on the market. And not only casualties, but also broken pieces of equipment that add lots of character to the set. Actually character is what this set has in abundance and I think that it will be great on any tabletop either as battlefield debris, casualty markers or just decoration for a command base. The guns are based for Republic to Empire and I have to say, with 6 minis to a base they are quiet crowded. So much so, that I left the ammo chests I painted up as well off. In retrospect I think I might have gone and based them with 4 crew each and bought two additional guns. But this way there is more action to the bases. I went and changed some mini around between crews to make each base look unique and I think this paid off. 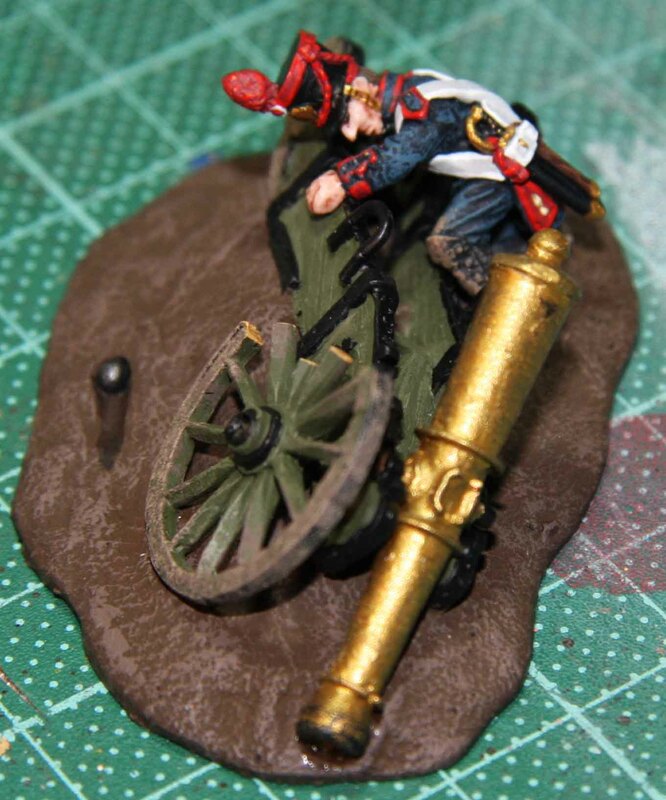 The other week I found something pretty Offensive in my mail, but I was expecting that and was happy with it, since it was Offensive MiniaturesFrench Artillery. (I never said I had a good sense of humor! 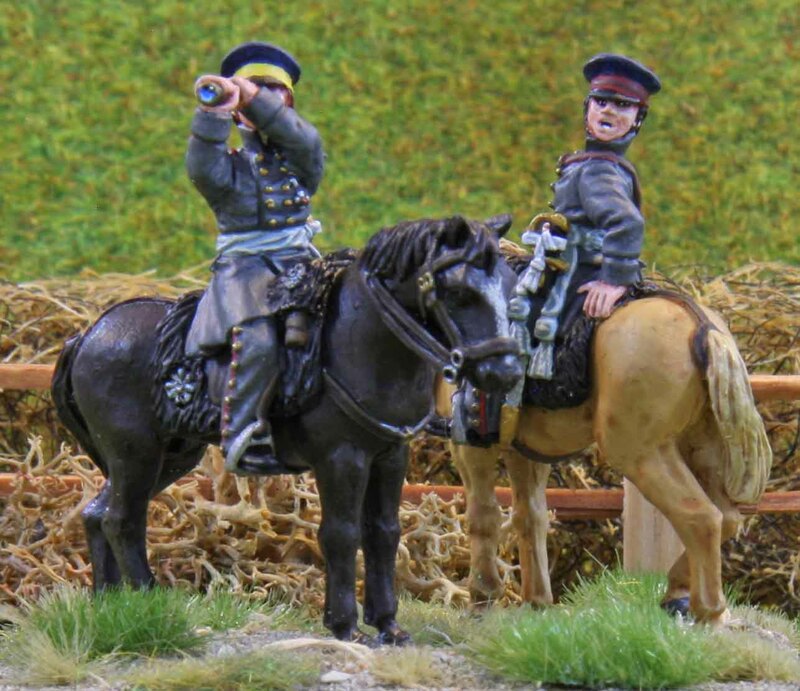 ;-)) Usually I know what you are going to say… “Will he do a review of every metal mini released as well?” No, I will not, but Offensive Miniatures is relatively small company and those who know them will most likely rather associate them with their WWII ranges, so I decided to give them a go. Now I got a battery boxed set. 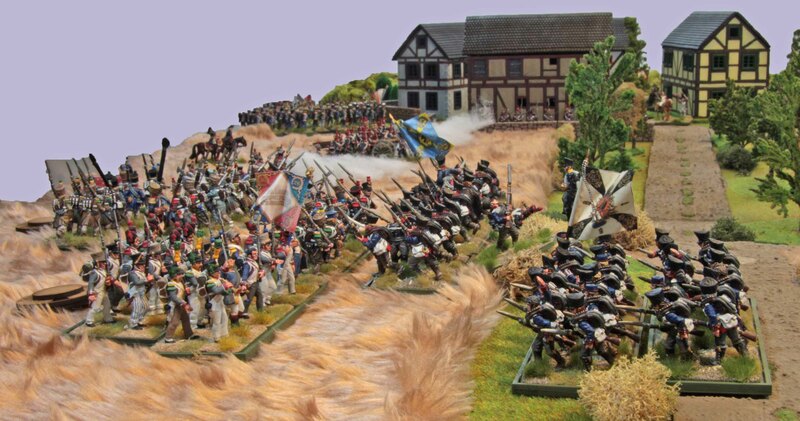 It contains 24 men (six for each gun), four guns and some loose equipment (two spare wheels, two stacks of cannonballs and a total of six ammo chests). In my case, since I went for FNFR251, this meant three 12pdr. 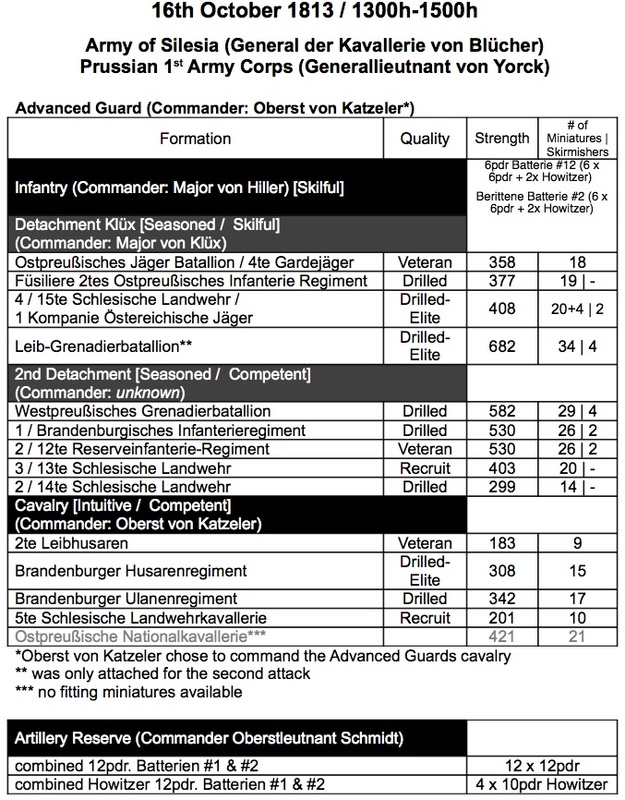 guns and one 6″ Howitzer. 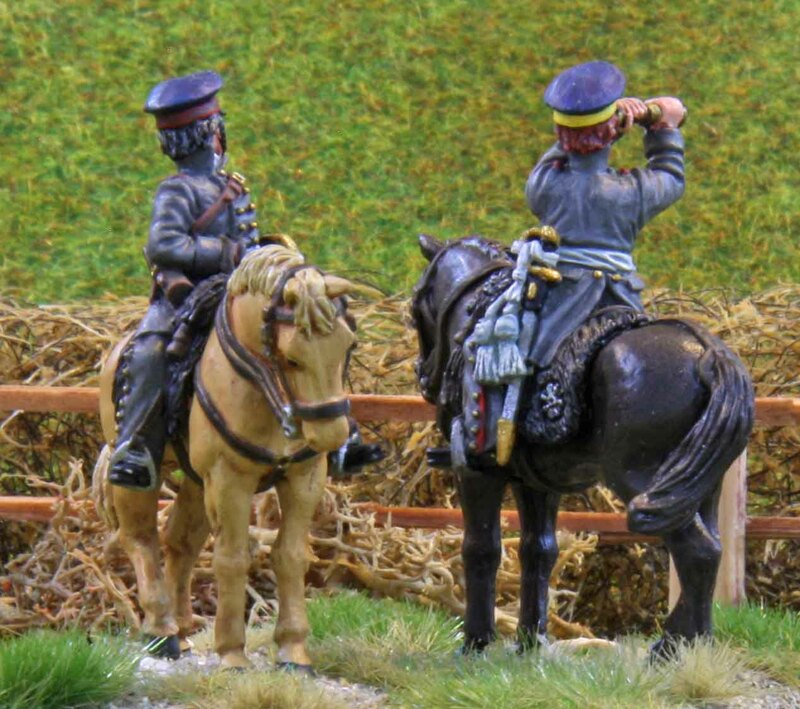 The minis themselves wear the pre-1812 uniform with uncovered shakos. Each mini is in there twice, so there are 12 different poses in all. While one crew is loading / running the gun and the other firing, there are a few poses in each set, that are not distinctive of that phase, so one could shuffle them around a little, to create 4 different crew compositions. All the minis are nicely animated and anatomically correct. The guns are from the Gribeauval system period. 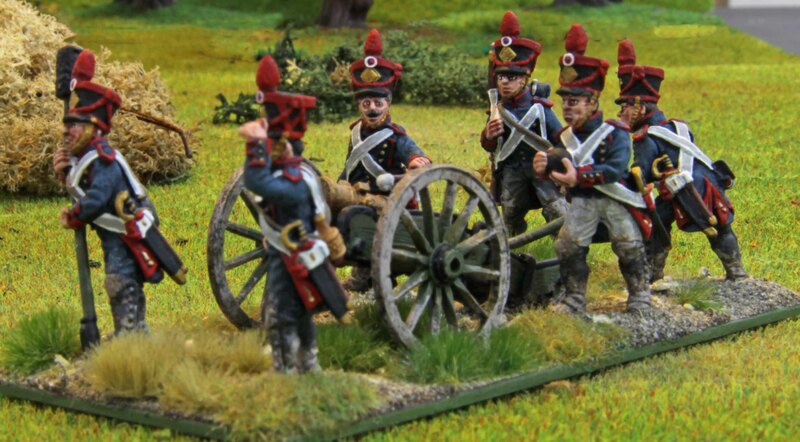 Since the newer an XI (Year 11) guns did not arrive in Spain these would be suitable for the Peninsular Campaign. 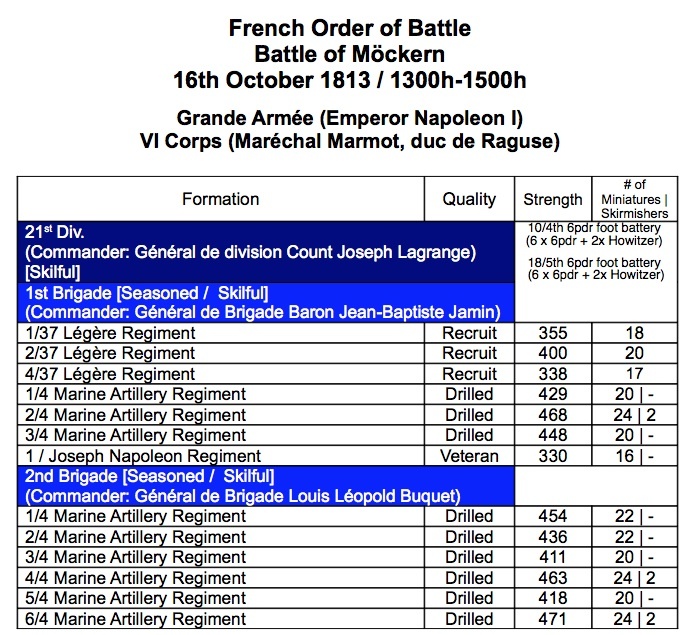 I doubt that a complete transition had taken place by 1813, so in small numbers they should work until that time, too. If you buy these as a single gun with crew, the price is 12 GB£ for six minis, one gun and some spare equipment. If you buy them as part of a battery set the price for each gun with crew comes down to 11,25 GB£. By comparison a Perry gun with six crew (FN 132) costs 10,50 GB£. So price wise they are at the lower end of the metals around, especially when bought as a pack, like the sample here. Now the detail on the minis is really good. Nice crisp and clear with no undercuts (as can be expected from metals). The animation is good and lively, as well as anatomically correct. I had no bubbles or mould misalignments with these minis and flash was minimal. In some cases (as could be expected with the lively animation) there are mould-lines running over the faces, but these were removed easily and without damage to the faces. Generally much the same goes for the guns. Minimal flash and no misalignment either. I was very impressed with the insides of the wheels. Those were all cast perfect with no bubbles in the spokes and even less flash. 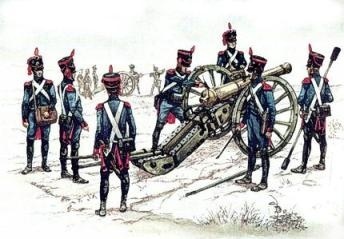 The 12pdr. barrels all had a minor dent at the same spot, which suggest damage to the mould, but this can easily be fixed with greenstuff or even white glue.The carriages feature a very nice woodgrain detail. On the 12 pounder carriages these is obscured around the handles, my guess being that this is glue from fitting together the parts on the master. This can be recut with a sharp knife, but it still is a shame. Do not take these “defects” as major shortcomings though. 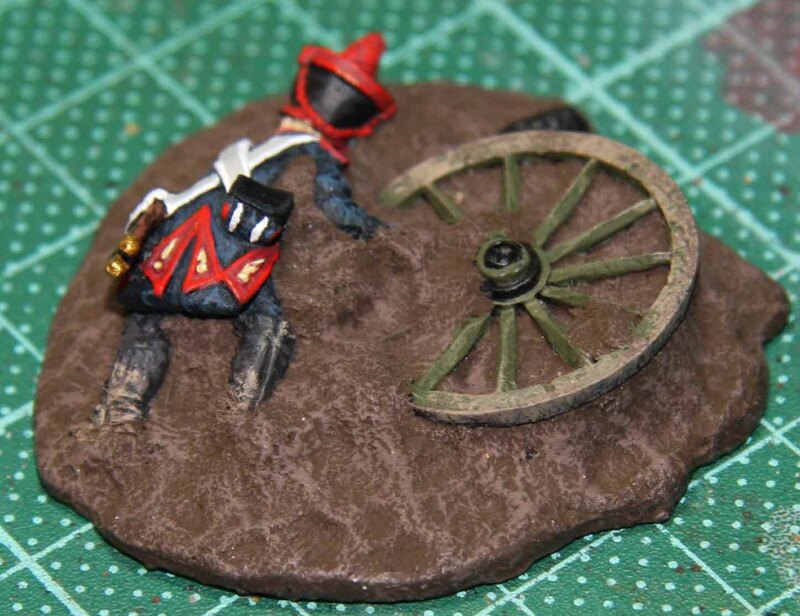 I have had more miscast spokes and carriage details on an average Perry piece. 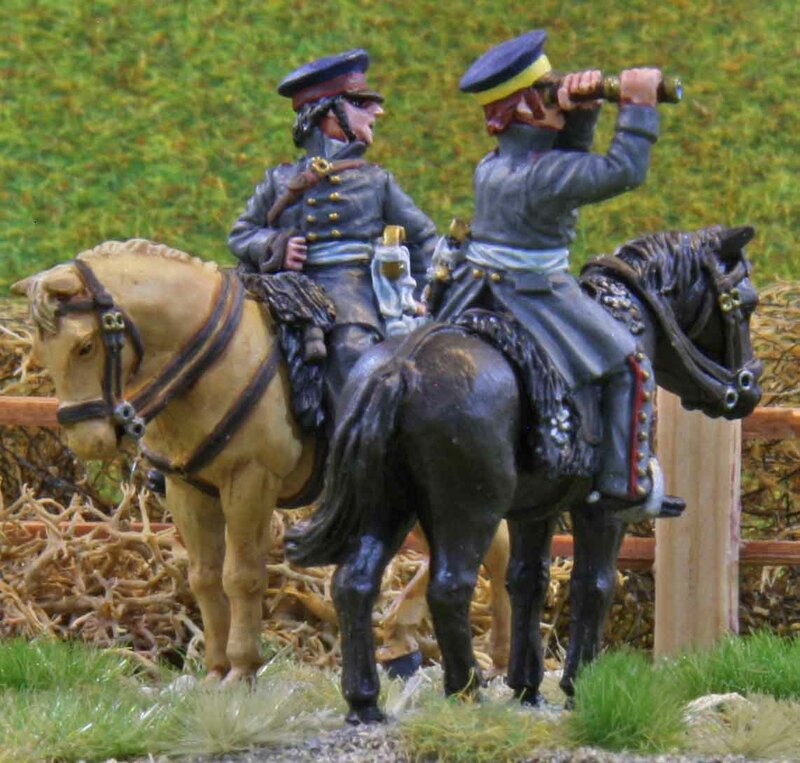 When compared to Foundry or Perry Miniatures, they are a little smaller, but their bases are a little thicker, which makes them end up the same hight. The heft is stronger on the Offensive Miniatures, which is mainly visible on the faces, but not enough that one would notice too much… IMHO they could even be mixed within a crew. The style of sculpting is vastly similar. 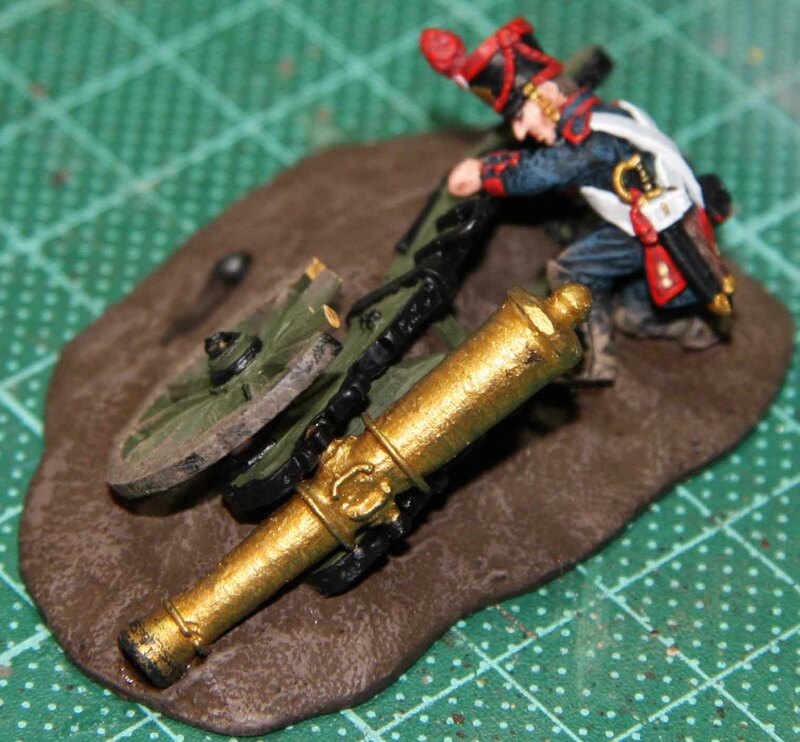 Even to the level that when I saw some early Foundry French artillery on another blog the other day, I first though they were Offensive Miniatures. So one should be able to base them together without either standing out. 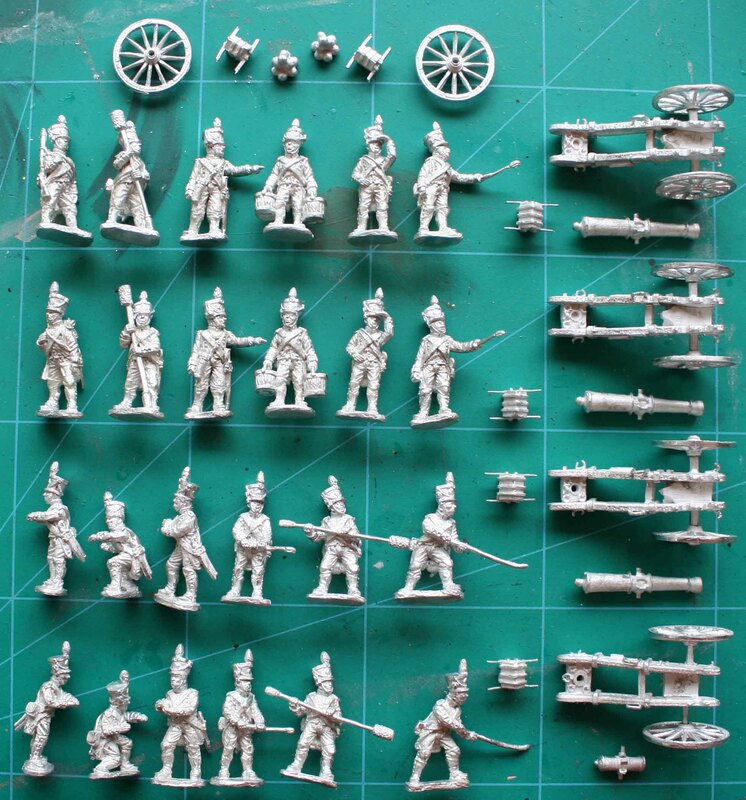 While they offer no French plastic artillery (yet) I also decided to compare them to the Victrix French, since their infantry is a good fit period wise. 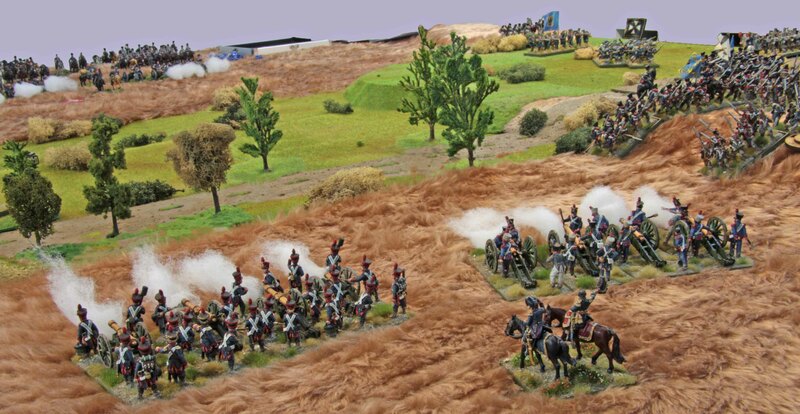 As you can see from the shot above, they are smaller than Victrix, with the bases about the same size. The heft is vastly similar and the same can be said for the sculpting style. 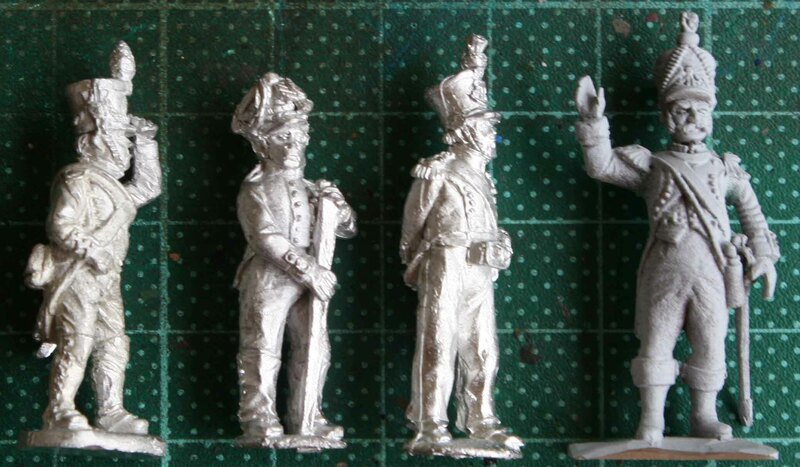 The main differences comes from the different mediums (metal and plastic) and the fact that the faces on the Victrix minis are a bit more exaggerated. 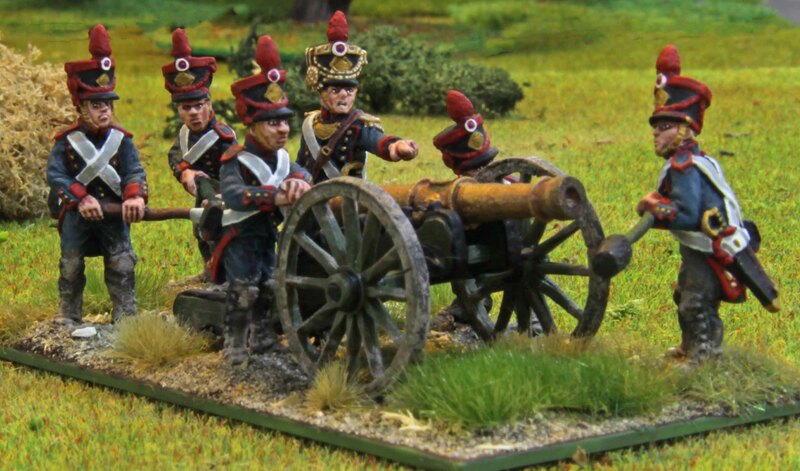 I would not base them together on one base (maybe if you cut off the base from the Victrix minis), but would not mind fielding an Offensive artillery battery besides Victrix infantry. I would have loved to compare the guns to other manufacturers (size wise) but the only 12 pounders I have are from Perry and those are an XI models, so they can not be compared. All in all this is a very good offering. 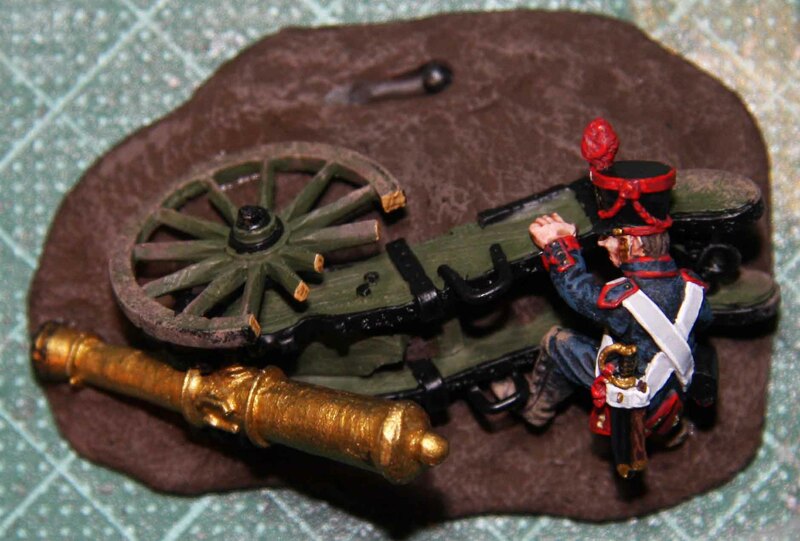 You get very detailed, historically correct and animated minis, for a price at the bottom end of Napoleonic French artillery. Plus some extra parts, which even if you do not use them on these bases will make great battlefield clutter on infantry or command bases. 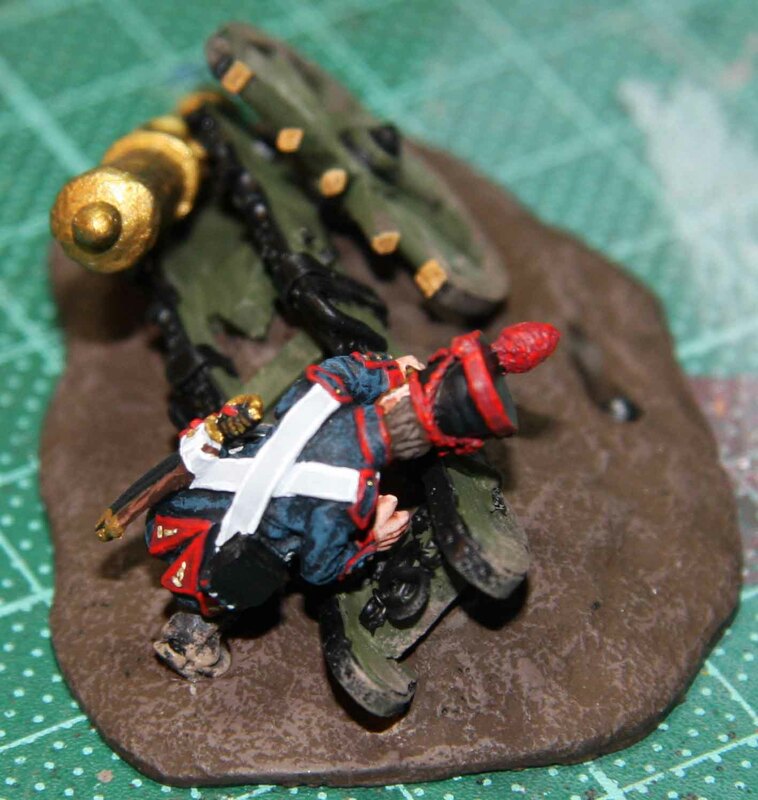 (By the way… there is also a very nice set of French artillery casualty markers that go with the artillery and if you want to add a little flavour to your bases you should take a look at those as well!) The minor defects do not offset the quality and value of the rest of the set and I would recommend them to anyone who feels they do fit his collection period wise. I shall definitely get myself the 8 pounders in due time. 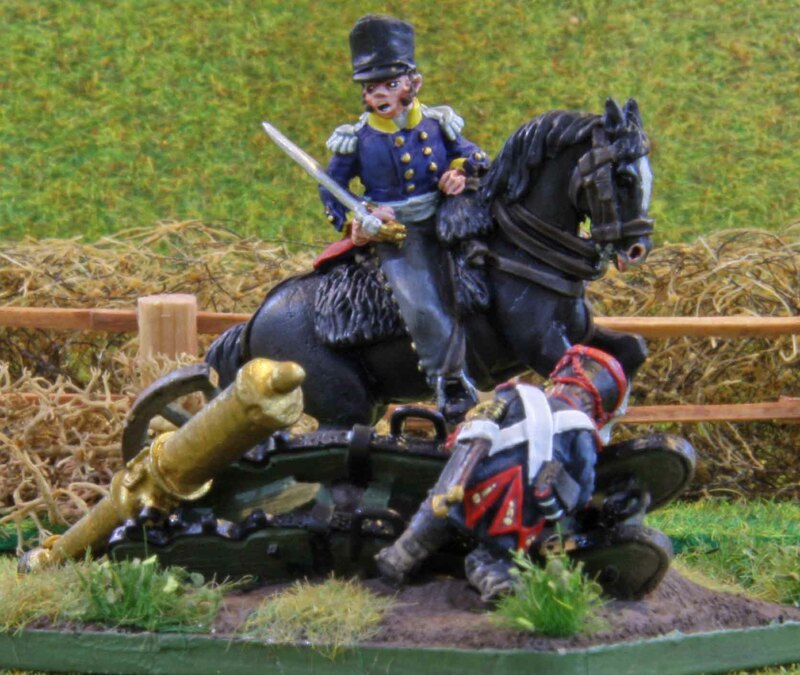 Dave at Offensive has also hinted, that they will add to their Napoleonics line in the future and am looking forward to seeing those as well!